Condition is New Sealed. Item says it is a display but i have opened two to re-set locally and hvae found no display app on either and display mode doesn't turn on if you let them sit. That being said it may or may not have a display mode app on it. 4.5 out of 5 stars - Samsung Galaxy Tab E SM-T560 16GB, Wi-Fi, 9.6in - Great Condition!! 297 product ratings297 product ratings - Samsung Galaxy Tab E SM-T560 16GB, Wi-Fi, 9.6in - Great Condition!! Galaxy Tab A SM-T350 Tablet 16GB Smoky Titanium. Samsung Galaxy Tab A SM-T350 8.0“ Tablet - 16GB. MicroSD Card. Samsung Galaxy Tab S3 T820 32GB, Wi-Fi, 9.7in - Black NEW OTHER. 1 New Other Samsung Galaxy Tab S3 T820 - 9.7" - 32GB - WIFI NO Box. Storage Capacity 32GB. 1 New tempered glass screen protector ( will be installed on tablet). Samsung Galaxy Tab E Lite SM-T113 8GB, Wi-Fi, 7" White. - Samsung Galaxy Tab E 7". Compatibility: Will work on WiFi universally. What's included. Empower your child's learning with fun and educational content from characters they love.3. Manufacturer: Samsung IT. With our dynamic pricing model, our prices are always competitive. Item color: White. Storage Capacity 16GB. You will receive the listed tablet. Family Line Galaxy Tab Pro. Type Tablet. User Manual. Processor Manufacturer Samsung. Display Max. Resolution 2560 x 1600. Samsung Galaxy Tablet. What's included. Battery Capacity: 5000 milliampere hours. Samsung Galaxy Tab A 8.0" 32GB. 32GB internal storage. Expert Service. Unbeatable Price. Owner's manual. The right combination of fast performance and power efficiency. Condition: Used. Good condition. Tested and working. Has some scratches display, back and sides. Also have some small dents on the back. You can see what exactly is included in the photos. Description: Samsung Galaxy Tab E 16GB Wi-Fi SM-T560NU 9.6" (Black). What’s included: One Samsung Galaxy Tab E 16GB 9.6" (Black) only. What’s not included: USB cable, AC charging and instruction. Original box and packaging: Not included. Samsung Galaxy Tab A 8.0 16GB SM-T350 Tablet. Certain phones will require a sim card or an existing smartphone data plan. make Supersized seem small. OB105-E R52H311V61X SV. Unlocked Cell Phones. Phone Body & Screen Protectors. The 10.5" Galaxy Tab S4 64GB Tablet from Samsung is an adaptable tablet designed for multitasking whether you're stationary or constantly on-the-go. It features a 10.5" AMOLED display with a 2560 x 1600 resolution, an octa-core Qualcommm processor, 4GB of RAM, and 64GB of storage. Tablet only. All photos are of our worst conditioned item in a lot. You will likely receive an item of equal or better quality than the actual photos. Does not include any accessories, only receive what is pictured. 1 NEW other Samsung Galaxy Tab E T560NU - 9.6” - 16GB - WIFI NO Box. 1 New tempered glass screen protector ( will be installed on tablet). Galaxy Tab. 1.5GB RAM, 16GB ROM. F2.2(Rear) / F2.4(Front) Video Streaming, Video Player. Included is an AC adapter. Features : 1280 x 800 | Android 4.0.4 | 10.1" Touchscreen | Stereo Speakers | Bluetooth 3.0. • Tested for Key Functions, R2/Ready for Resale. Samsung - Galaxy Tab S4 - 10.5" - 64GB - Black. Explore, work and watch your favorite shows on a clear and stunningly brilliant screen. Transform your Galaxy Tab S4 into a PC experience with the taskbar youre used to with the revolutionary DeX. ModelSamsung Galaxy Note 10.1. Android 4.0.3 (Ice Cream Sandwich), upgradable to 4.4.2 (KitKat). - Samsung TouchWiz UI. Vibration; MP3, WAV ringtones. Insert the battery and sim card then turn on the phone. Condition: No retail packaging. Case has light scratches, but is free from any deep scratches, cracks, or other large blemishes. Screen: LCD works perfectly. Screen glass has light scratches, but is free from any deep scratches, cracks, or other large blemishes. O/S: The device boots and operates without issue. Audio: Tested and working. Mic: Tested and working. Camera: Tested and working. Wifi: Tested and working. IMEI Status: N/A Android Lock: No. Carrier: N/A Accessories: No accessories or cables are included, sale is for the tablet only. Stock photos used, but they are an accurate representation of what you will receive. Buy with confidence, we offer a 30-day money back guarantee. Orders placed by 9PM CST will be shipped on the following business day. Thanks for looking. 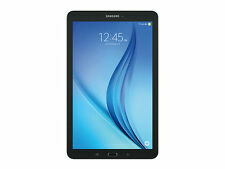 (1x) Galaxy Tab 2 GT-P3113. Does NOT include any other accessories not listed or pictured above. Hard Drive8 GB. Processor Speed1 GHz. The Tab A 10.5 is the latest technology and largest screen size within the Galaxy Tab A series. Samsung Electronics, SM-T590NZKAXAR. As an industry leader in product sourcing and reconditioning, we are expert in providing the best and finest quality products. Wi-Fi tablets let you connect to the internet wherever a wireless connection is available, assuming you have the password for that network. Samsung has a wide range of tablet options with 8-100 GB in disk space and 2-4 GB in RAM. 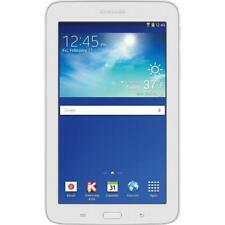 All Samsung tablets run on the Android operating system. What is a Wi-Fi tablet? This type of electronic device allows you to access wireless internet. You can use them at home, at coffee shops, and anywhere else a Wi-Fi connection is available. These devices have a large screen yet a slim, lightweight build. Screen sizes range from 7-12.9 inches. Weight ranges from 0.99-1.65 pounds. Some models are equipped with other possible internet connectivities. Others only enable a wireless internet connection. Regarding disk space and memory, you can find as high as 120 GB and 4 GB, respectively. Can you video chat and take pictures? As long as you install a video calling app and the device has a camera, you can video chat on a tab. You can also take pictures and possibly even HD videos, assuming your device has a camera. Some models have both a rear and front camera. Others have one of the two, so you must check the specs to know before choosing which device you want. What are common features of these tablets? Specific features vary depending on which model you buy. Typical specifications you'll find in these tablets include 8-64 GB of storage, 2-4 GB of RAM, and 1.2-1.9 GHz in processor speed. Rear camera resolution ranges from 5-13 MP. The front camera is around 2-5 MP. Many models offer microSD expandability. The operating system for Samsung tabs is Android, but the Android version that is installed may vary depending on the model. Many models use adaptive display technology to adjust the screen's brightness as lighting changes. With an aspect ratio of 4:3, you can use the device in either landscape or portrait mode. Some models have ID fingerprint sensor technology that identifies your fingerprint and gives you access based on the fingerprint. It can be used for unlocking the device and authorizing payments. Many devices also enable word processing programs, so you can edit documents, spreadsheets, and powerpoints. Here are some steps to help you choose the right Samsung tablet for your needs. Step 1: First, you should decide whether you need additional internet connectivities in the tablet. Step 2: The next decision to make is how much disk storage space, memory, and processor speed you need. How you plan on using the device influences the minimum specs you'll look for. Step 3: Do you plan on taking pictures? If you only want to take selfies, then you can consider any tab that has a front camera. Once you've clarified these details about what you need, you will have narrowed down your options.